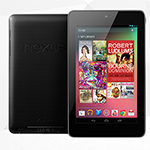 Following yesterday's price drop at GameStop, it looks like the Nexus 7 is slashing prices everywhere. Staples, Sam's Club, Office Depot, Wal-Mart, and a few other places all list the tablet at $199 (or a rough foreign equivalent). What's a little more rare is the 32GB Nexus 7 going up for sale in a few locations, though it's unclear how approved that is. Sam's Club has it up for order here, and PC Advisor is reporting that at least one user was able to buy the slate from PC World by asking for it, though it wasn't on display. Also, NewEgg has what looks like an incomplete listing here. This confirms earlier rumors that the 16GB/32GB options would be replacing the 8GB/16GB set we have now while maintaining the same price points. Curiously, the Play Store hasn't caught up to the news, as the 8GB model is still listed as "coming soon" while the 16GB model is, bizarrely, "not for sale at this time," which is a message we haven't seen yet. Despite the oddity, you can still sign up to be notified by email of the availability of either model.